Nothing says Christmas like having nails that resemble a sparkling Christmas tree. 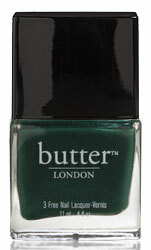 Butter LONDON polishes are fabulous because they look exactly the same on your nails as they do in the bottle. They are a little pricey at $14, but they stay on well and definitely get noticed. I am loving Chancer (red sparkle above) and British Racing Green (green shimmer below). They are the perfect stocking stuffer!